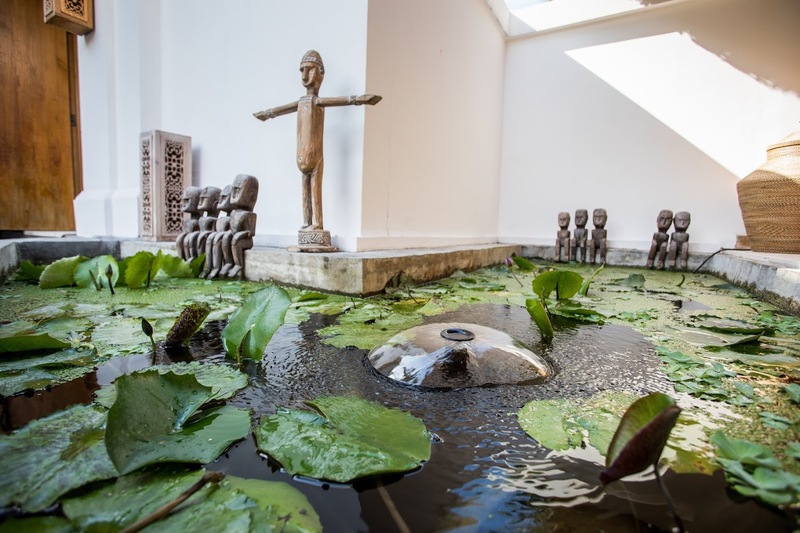 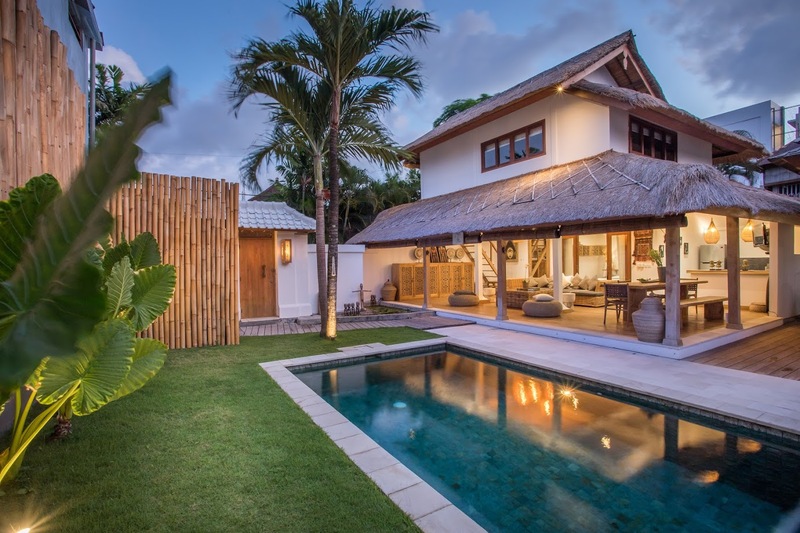 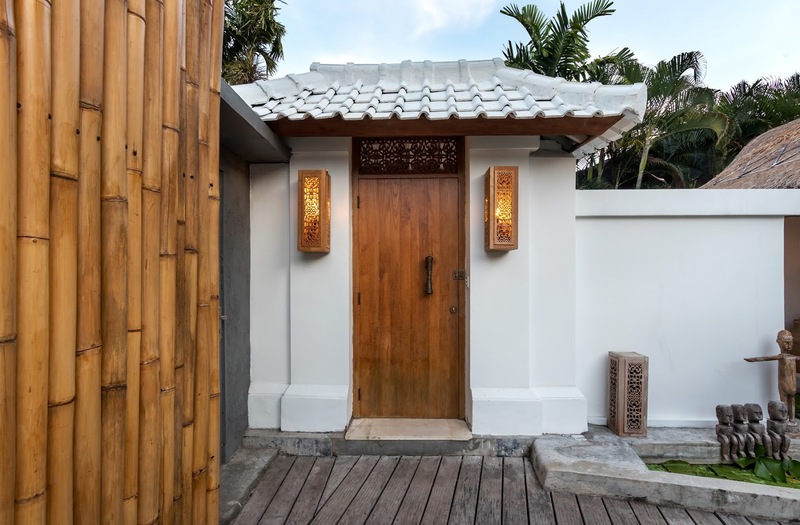 Featuring waterlily ponds surrounding its living spaces, Villa Waterlily in Seminyak’s bustling streets provides a sanctuary that is equally peaceful and calming to the soul. 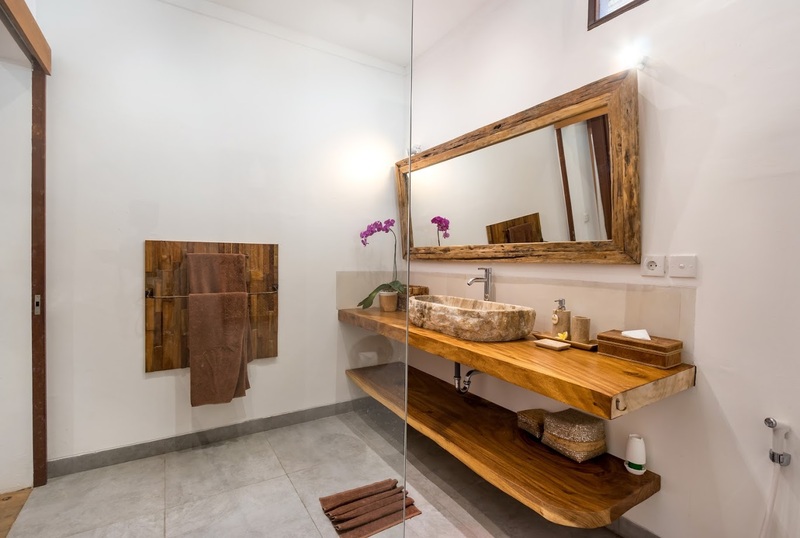 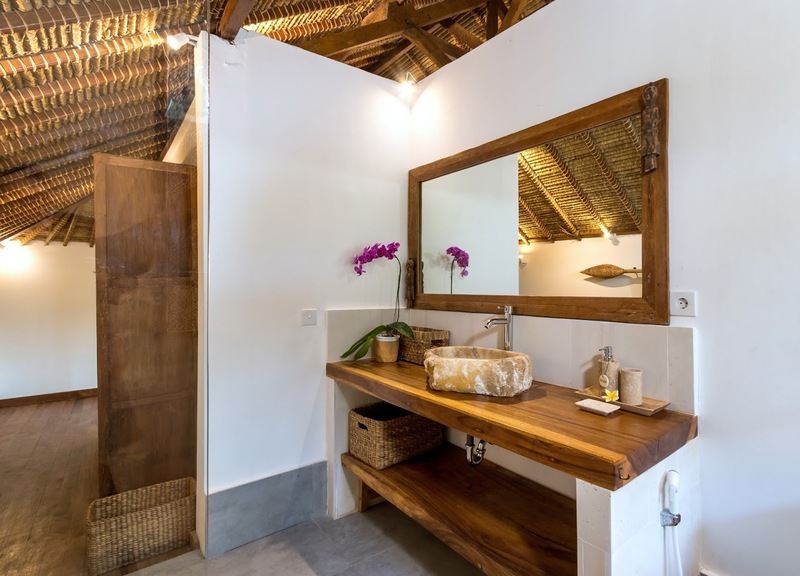 White and wood interiors made using natural materials create a space that is comfortable, luxurious, and at once homely. 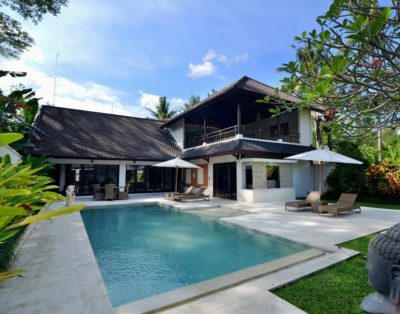 There are three bedrooms located in the main pavilion, and a private swimming pool that is flanked by tropical gardens. 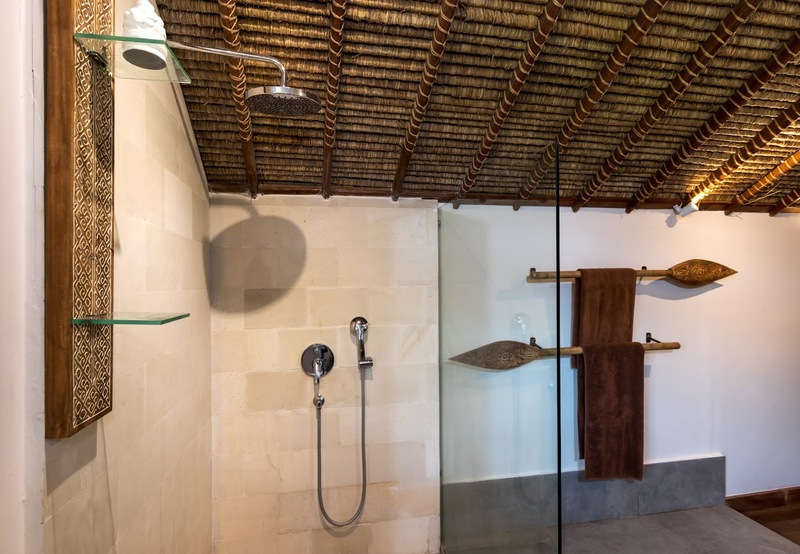 Located close to Double Six beach and Oberoi’s eat-street, there is so much you can explore outside the villa and not have to waste time on more travel! 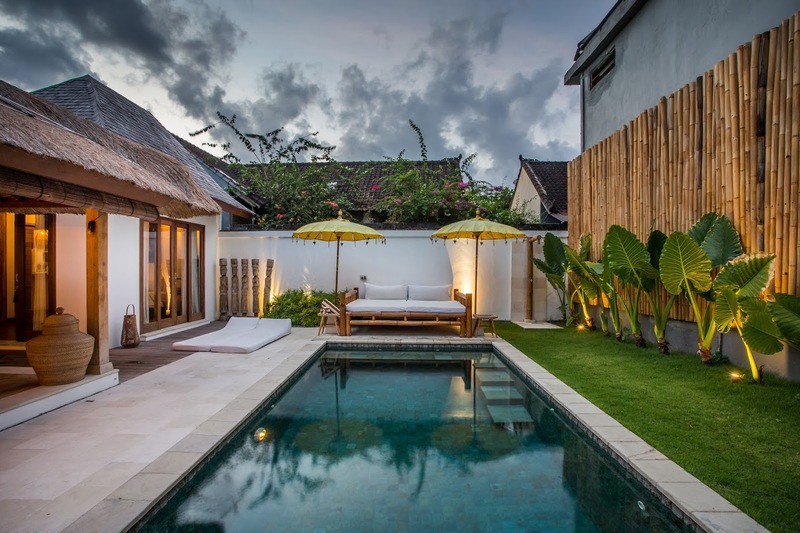 Set in a pristine landscape is the 6-metre swimming pool of Villa Waterlily wherein guests can find a relaxing spot under the tropical sun basking in its glory. 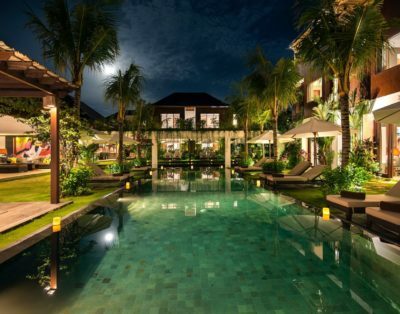 Surrounding the pool is luscious and verdant greenery that is well-maintained and ensures a fresh ambiance to guests. 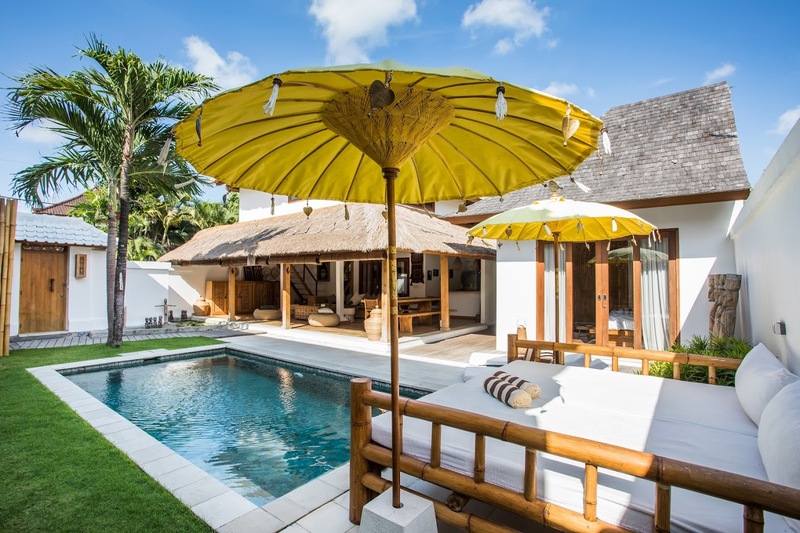 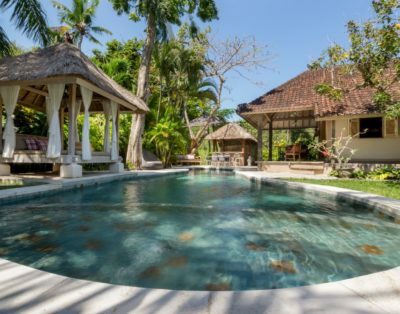 A luxurious, royal daybed flanked by two traditional, Balinese parasols is found on one side of the pool. 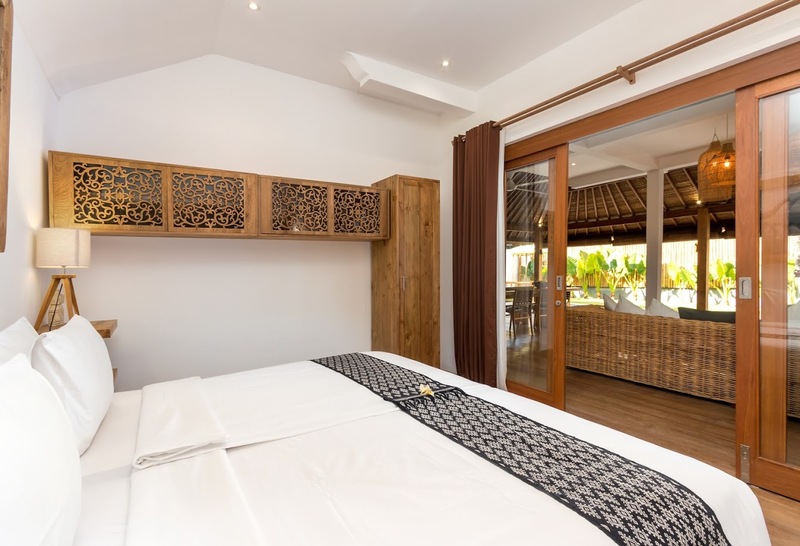 There are daybeds on the pool deck as well and these are ideal for napping or dozing off in the afternoons! 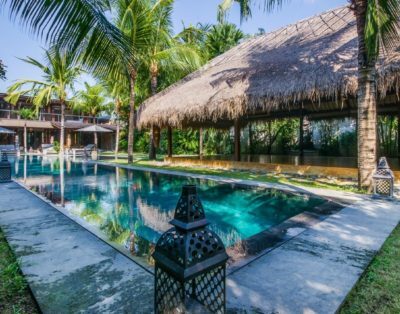 Around the pool, wrapped around the living area are lily ponds for a zen-like, meditative ambiance. 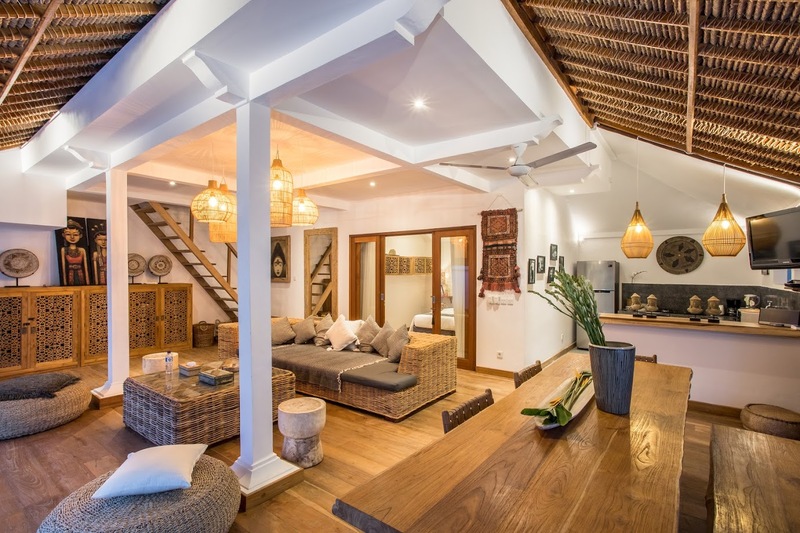 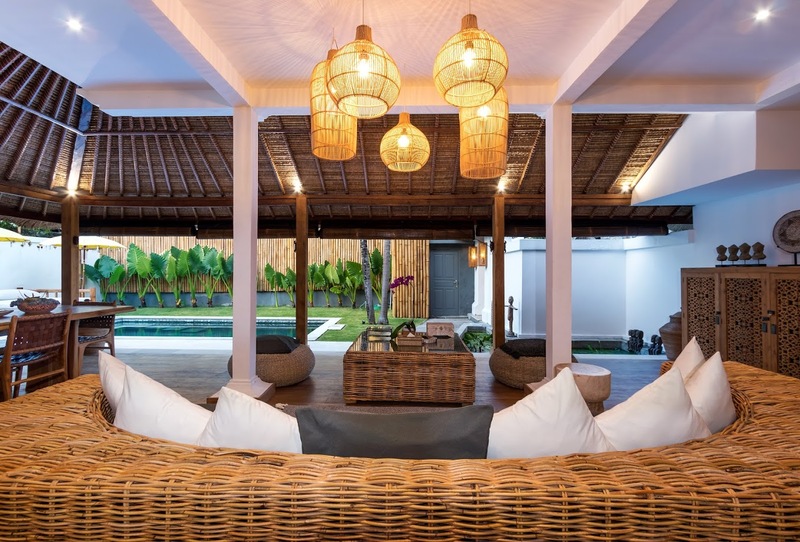 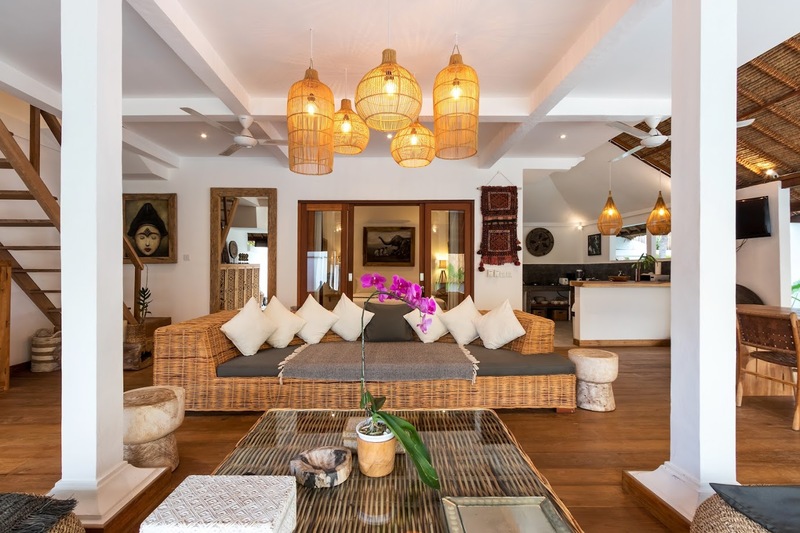 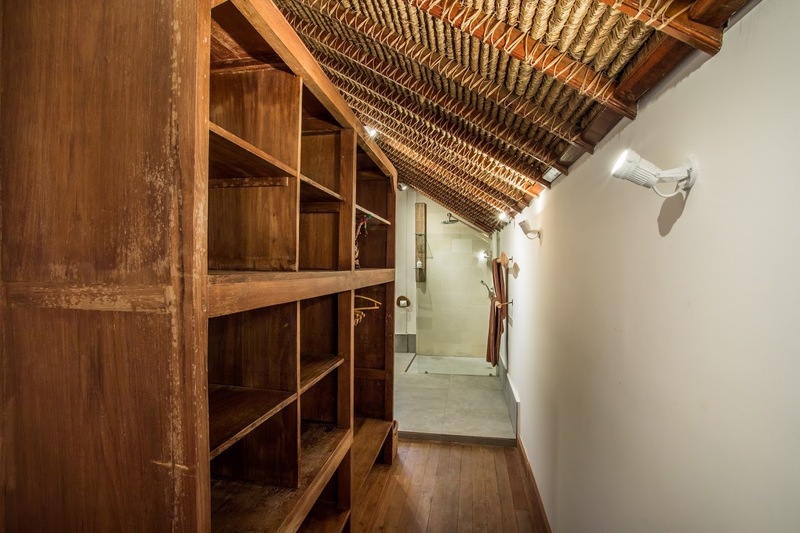 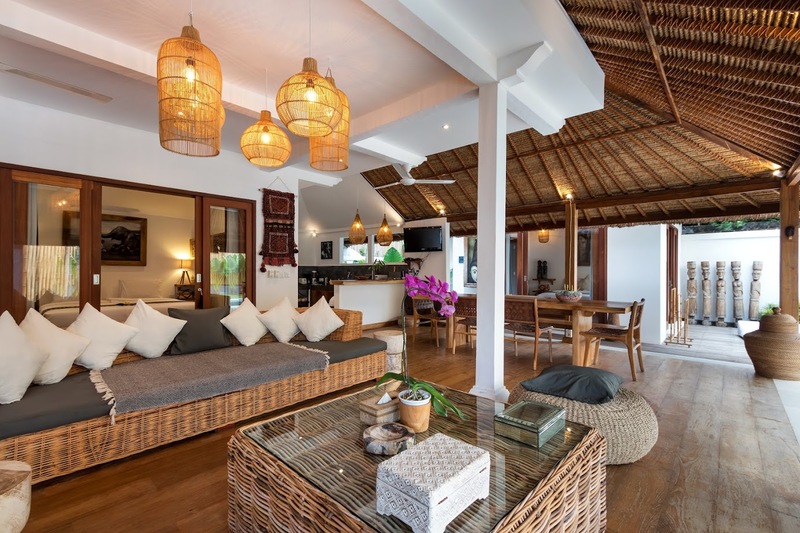 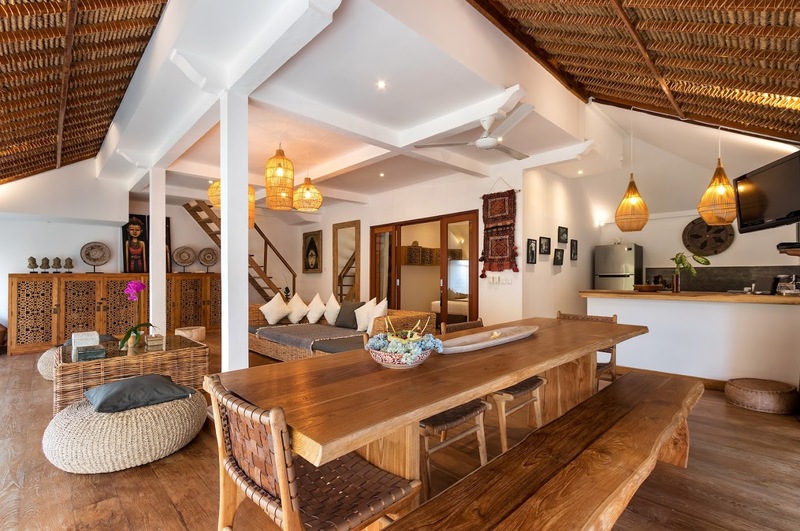 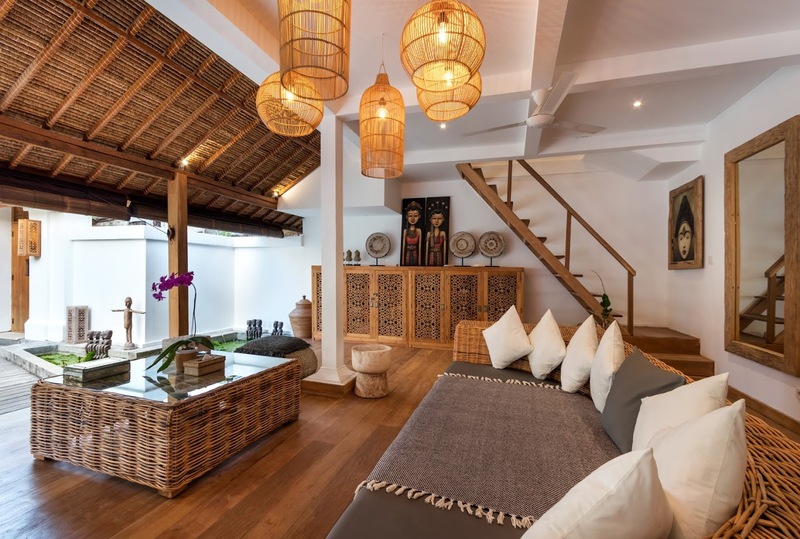 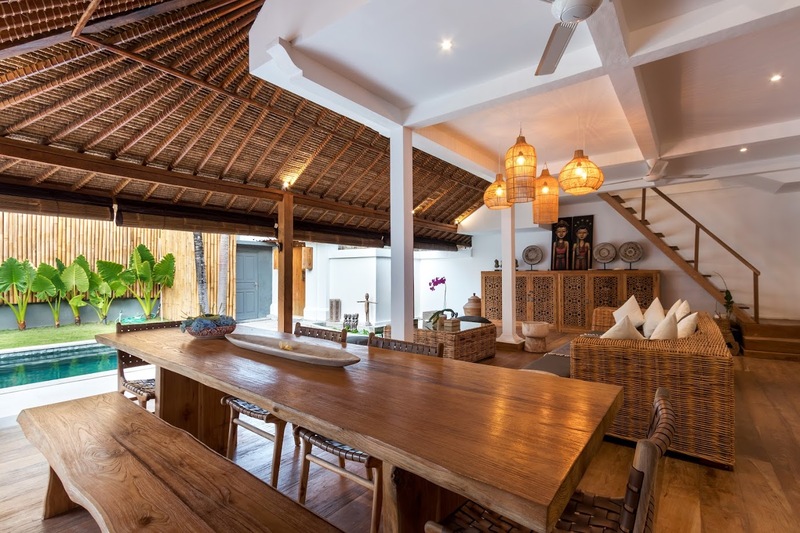 Tucked away in a traditional, alang-alang pavilion, the open-sided living area at Villa Waterlily is a pleasant space which can be enjoyed by everyone. 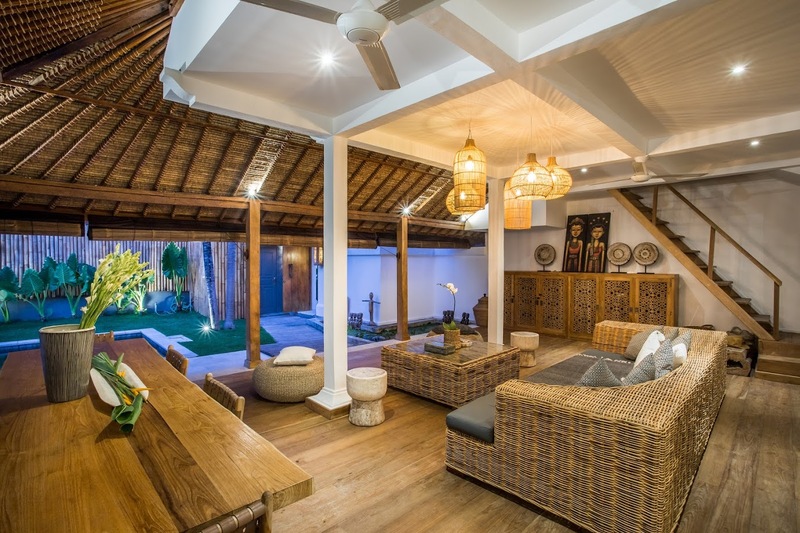 There are comfortable sofas set in the wooden pavilion where guests can rest up and sit back with ease while enjoying a view of the garden. 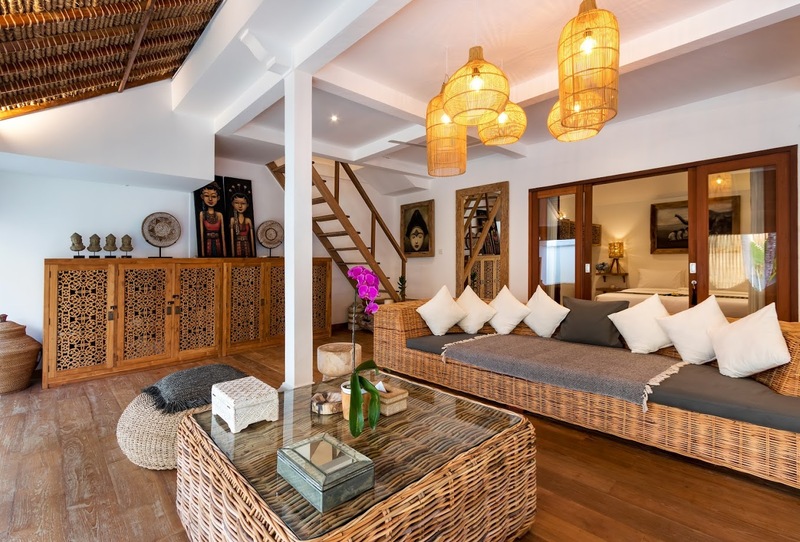 There are intricate lanterns hanging from the ceiling and antique cabinets with artefacts decorating the room. 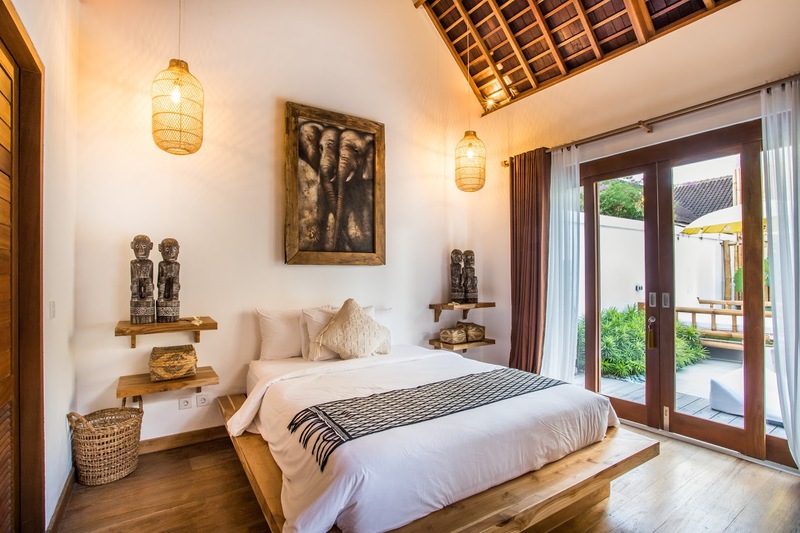 The warm décor allows the room to be familiar and homely so guests can be at ease. 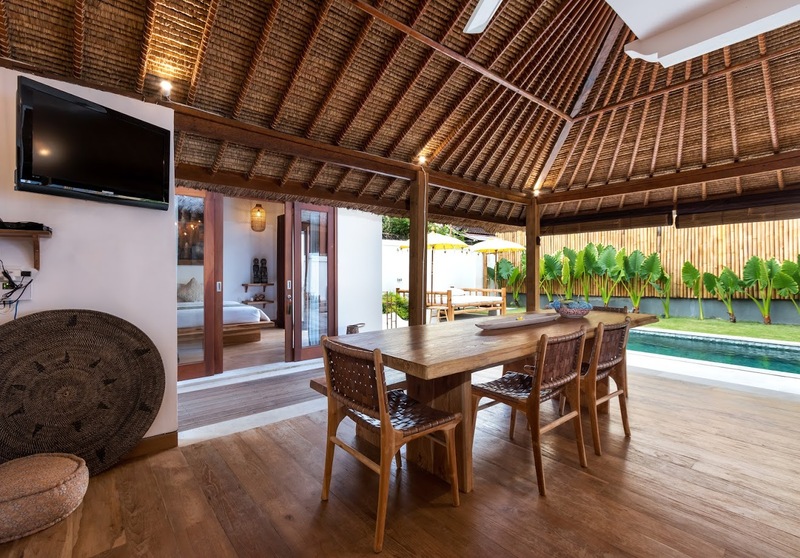 A wall-mounted television serves as entertainment once the sun sets and all you wish to do is idle around. 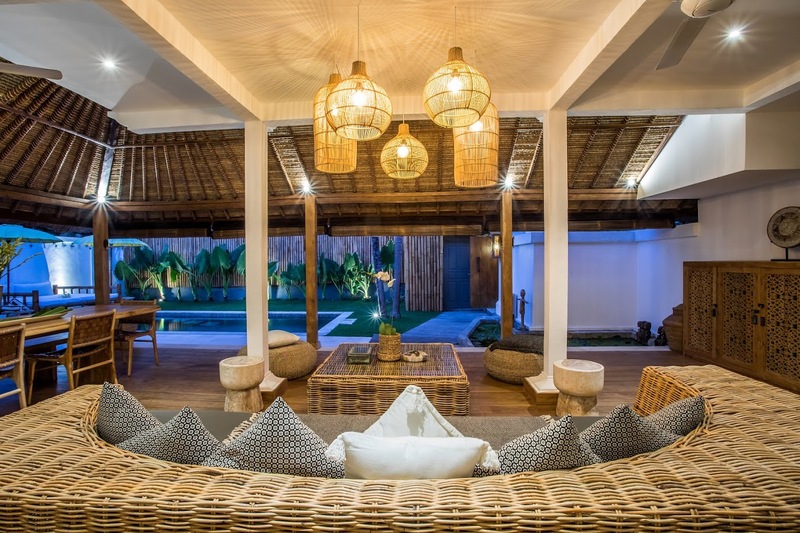 The dining area can be found next to the seating with seating for up to six guests as it features chairs and a bench. 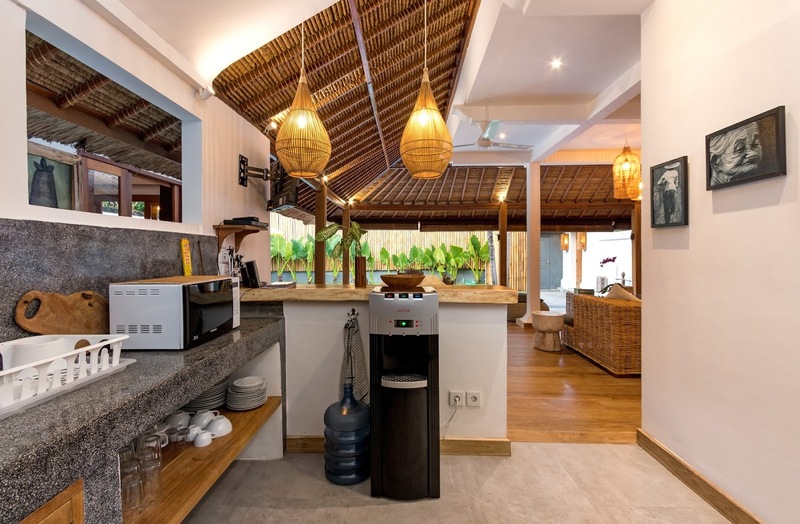 Towards the end of the pavilion, there is an open kitchen which is fully-equipped with modern amenities for guests’ use, especially since it has a Nespresso machine for your early morning fix. 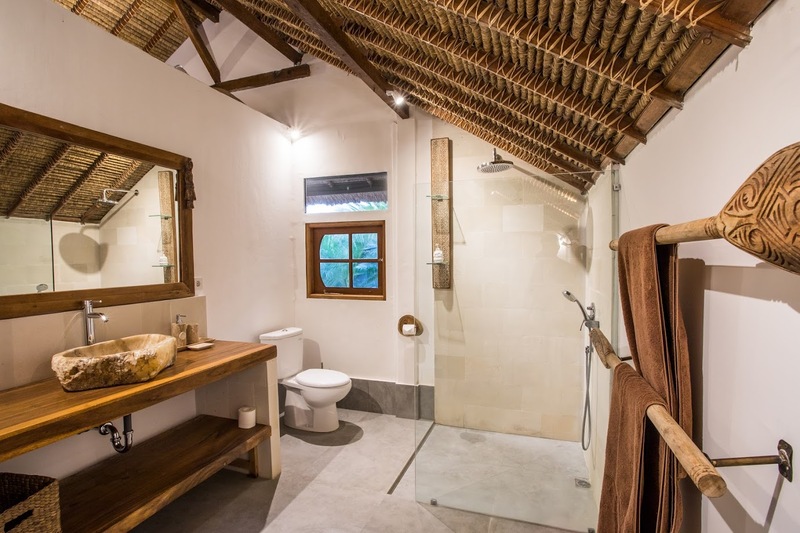 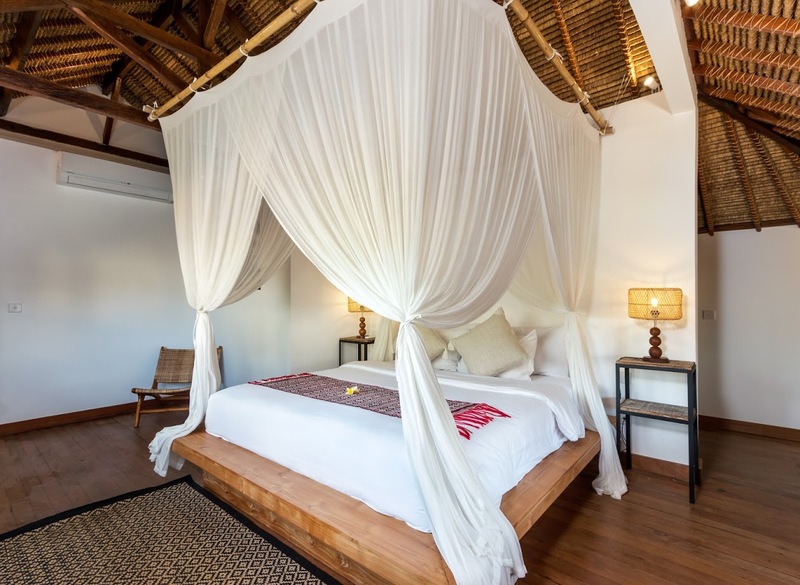 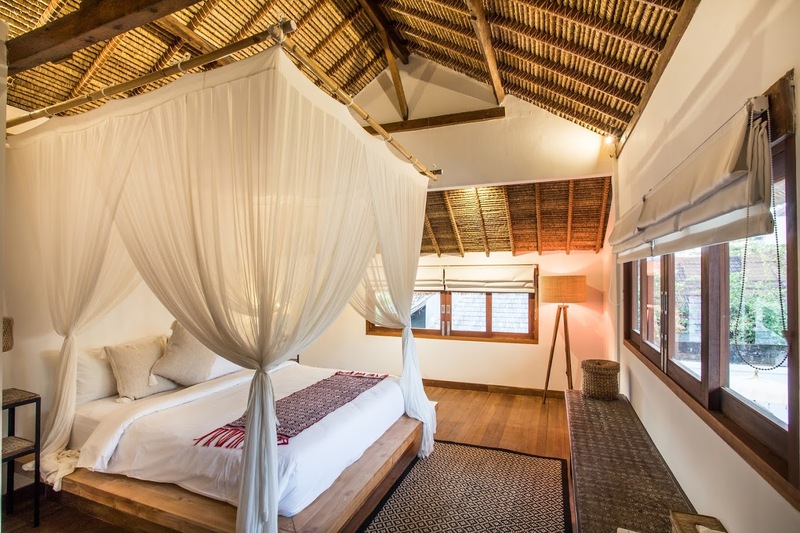 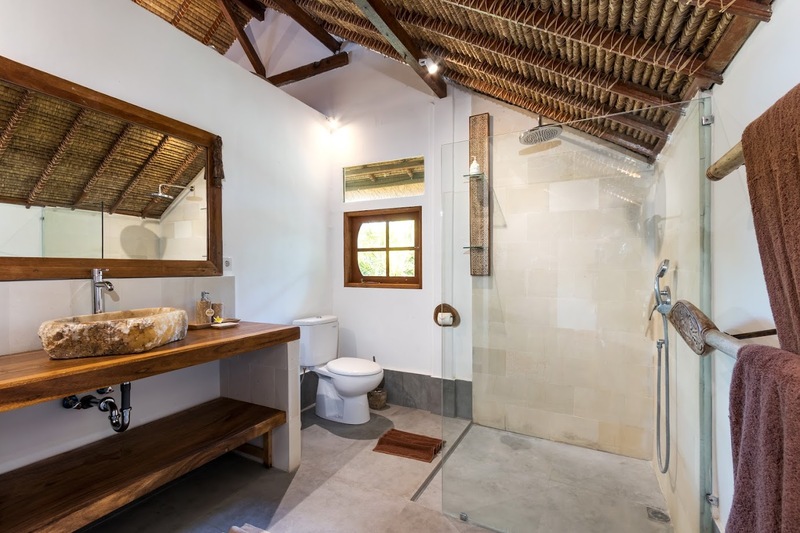 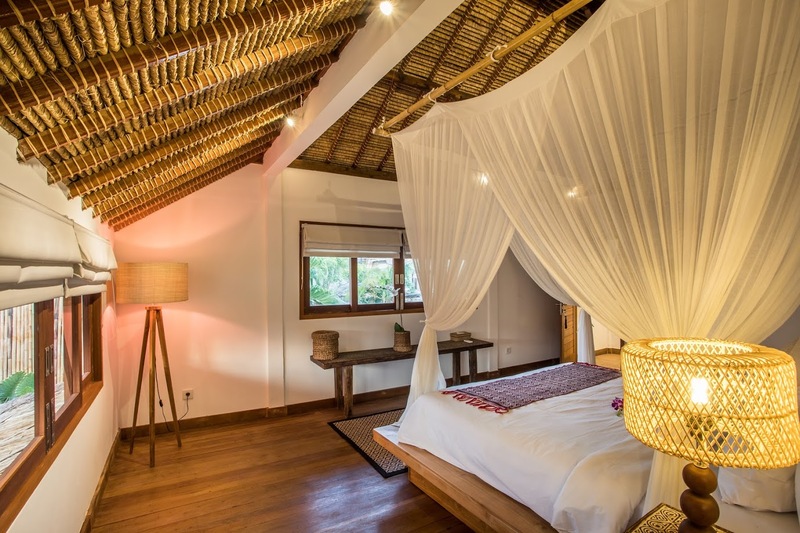 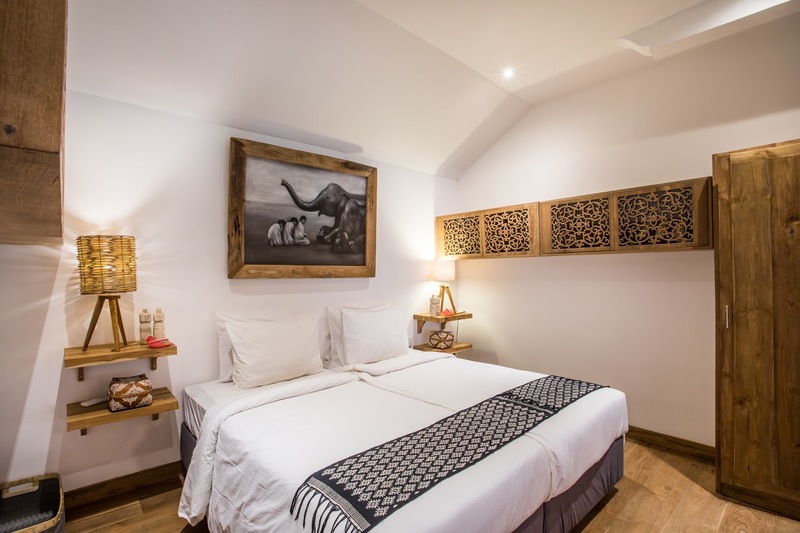 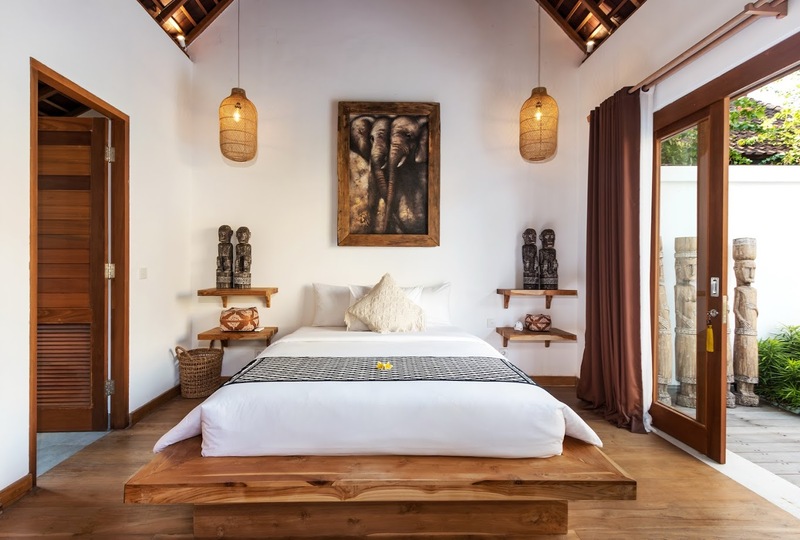 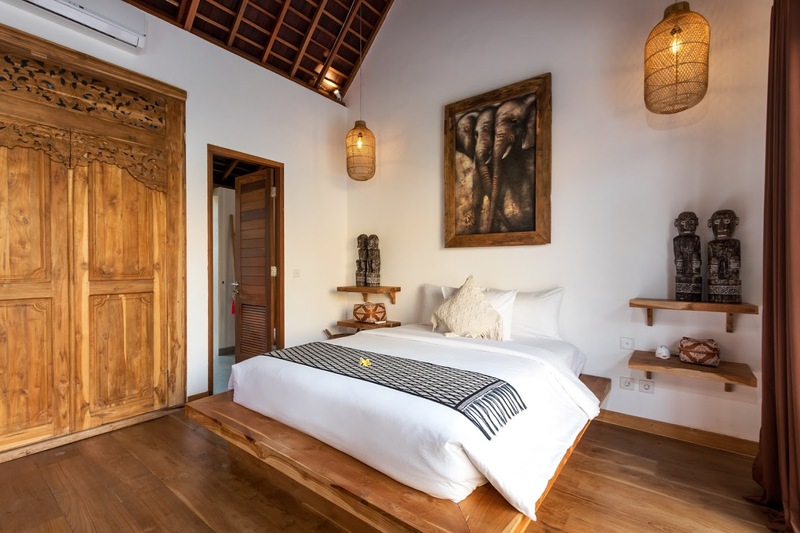 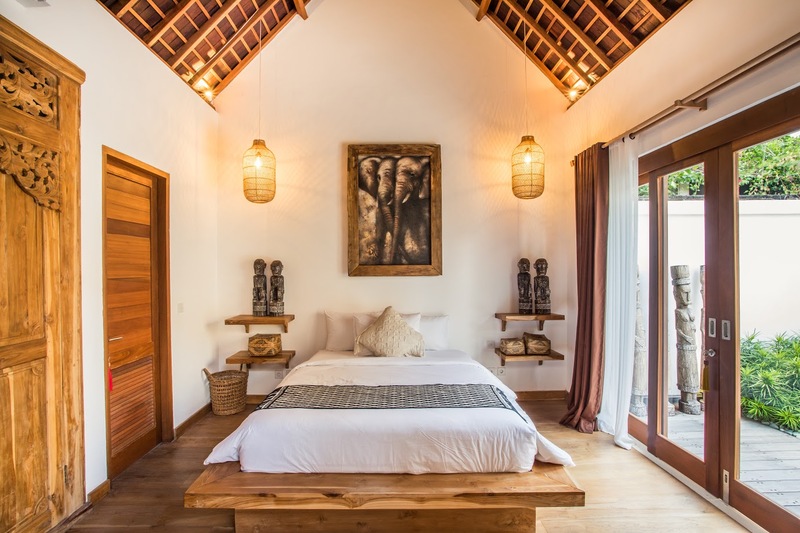 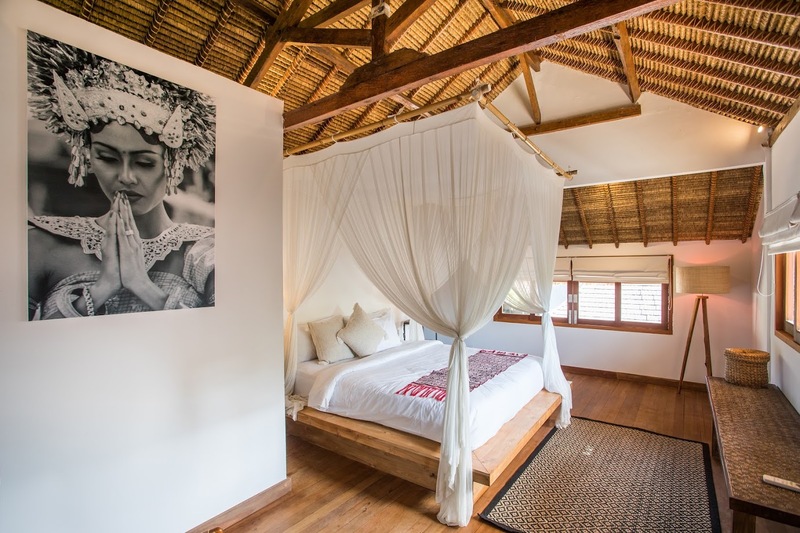 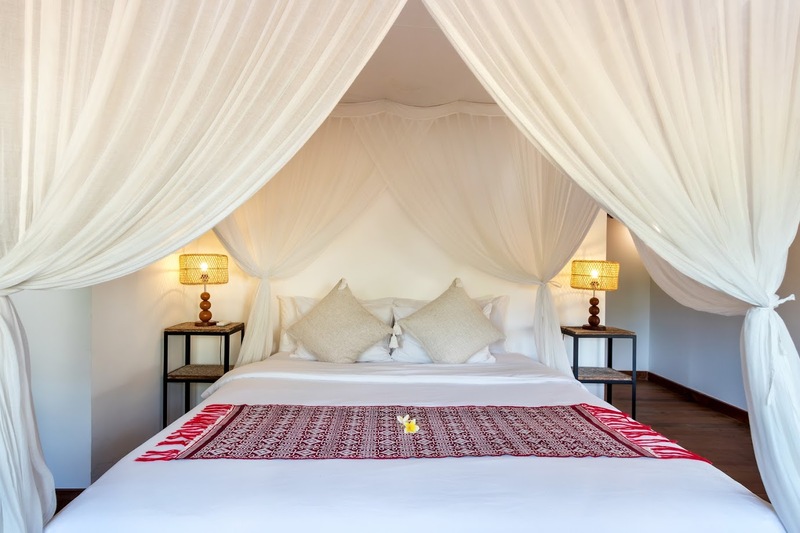 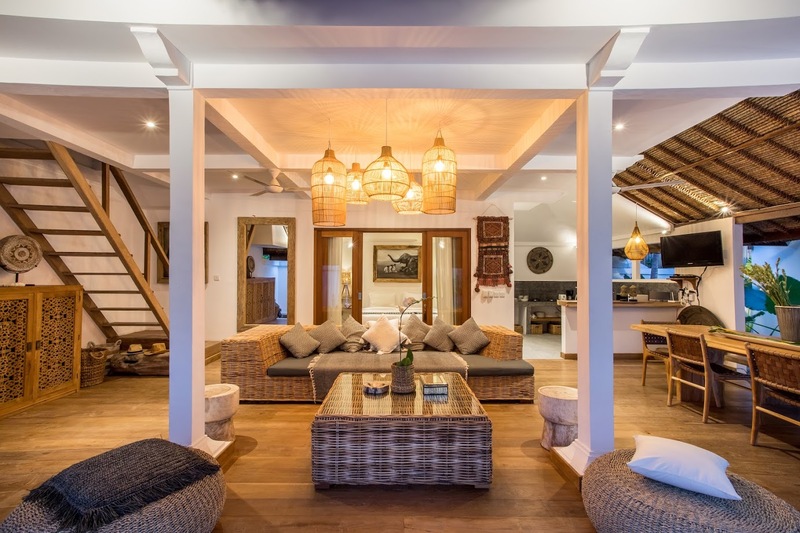 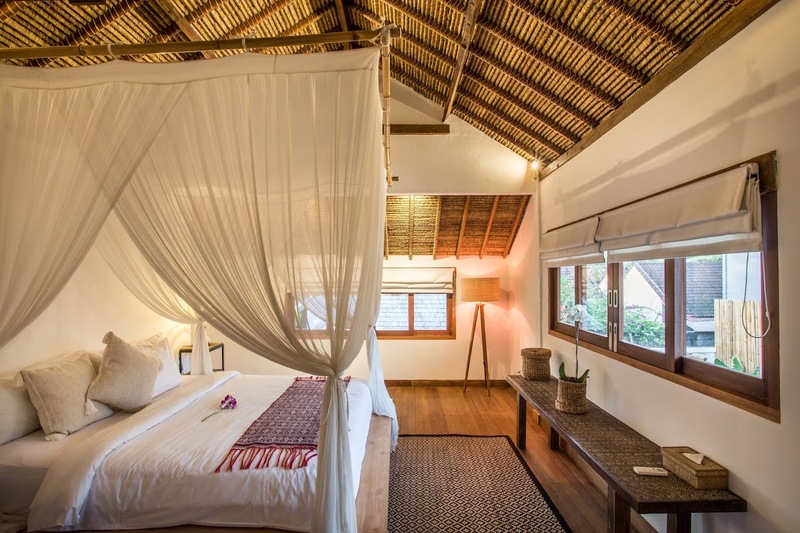 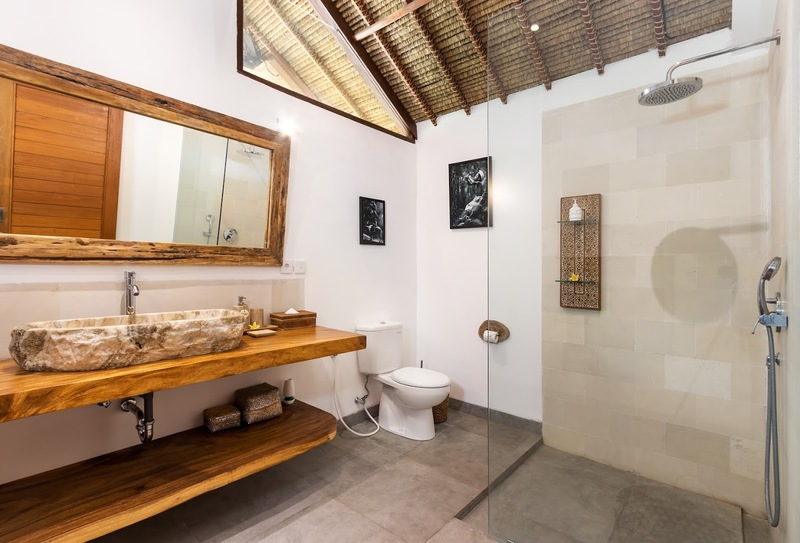 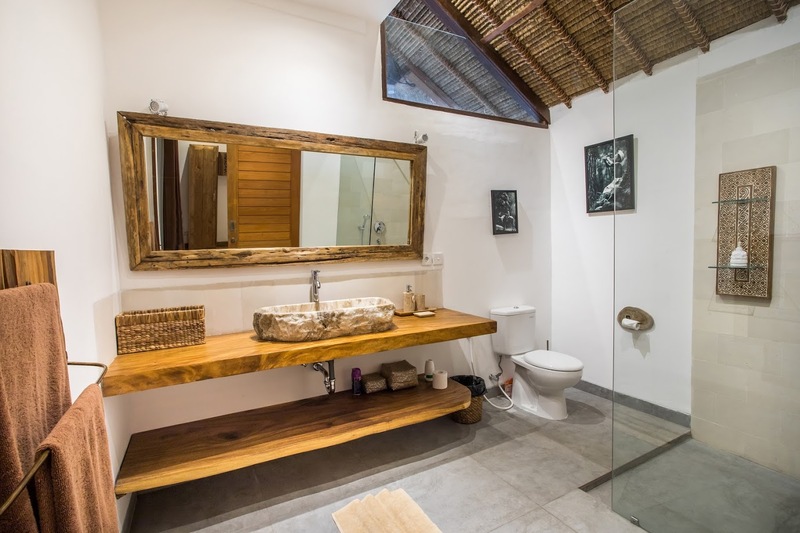 Villa Waterlily prides itself in offering three bedrooms that are air-conditioned and well-furnished each with its own en-suite bathroom. 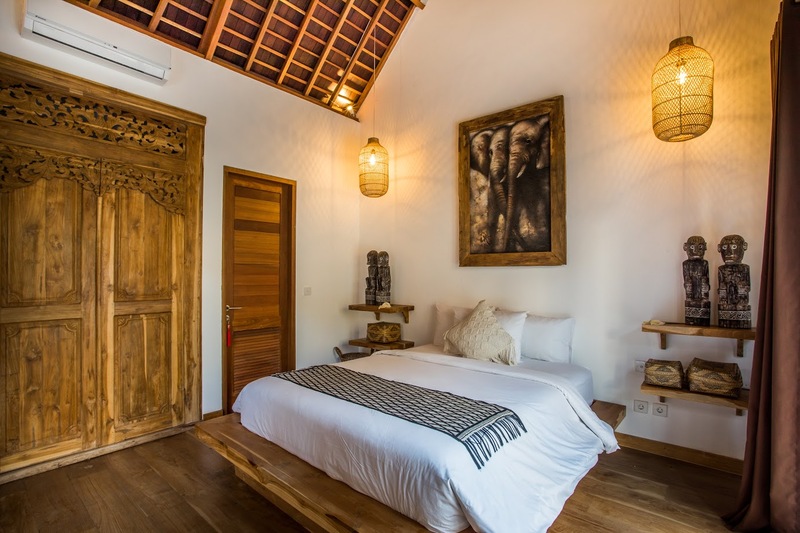 The master bedroom is found on the floor above the main living area and can be reached via wooden steps found in the living room. 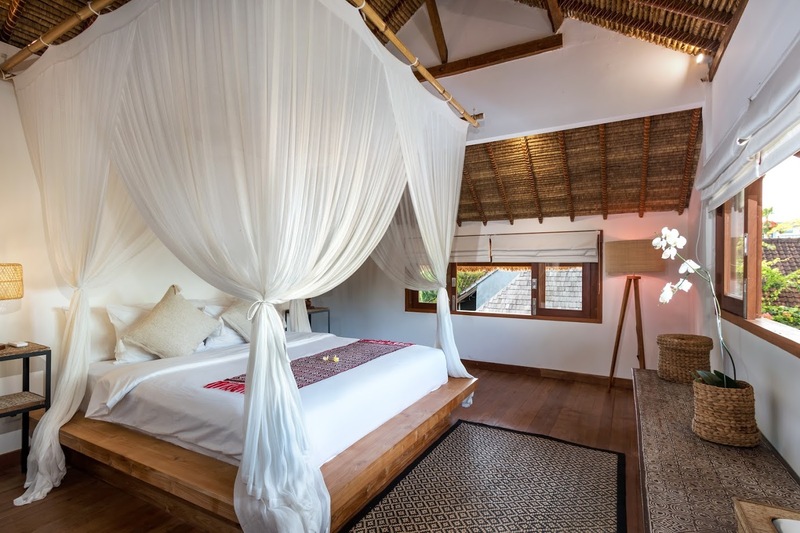 The room is furnished with a canopied king-sized bed and enjoys views of the property from the glass window. 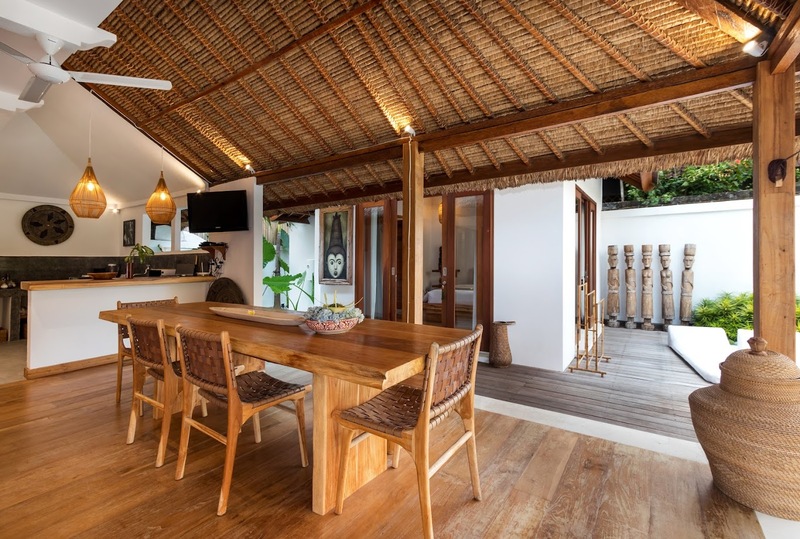 The simple, wooden interiors make the room elegant and classic. 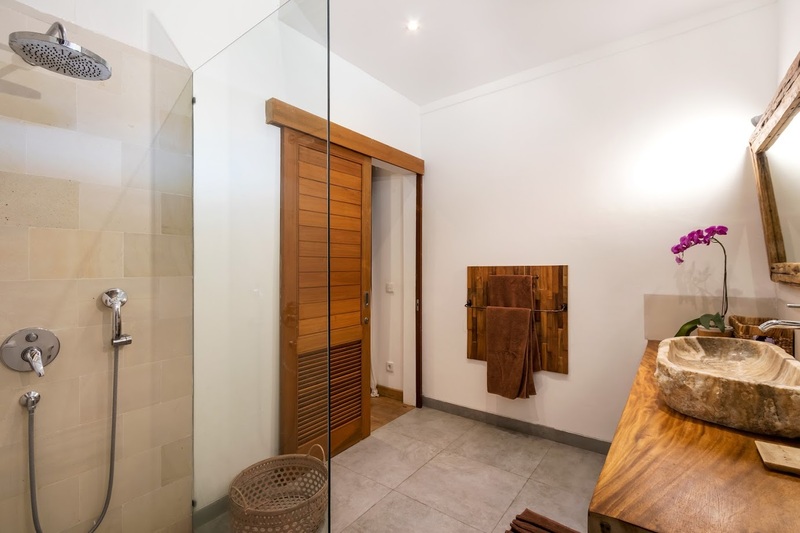 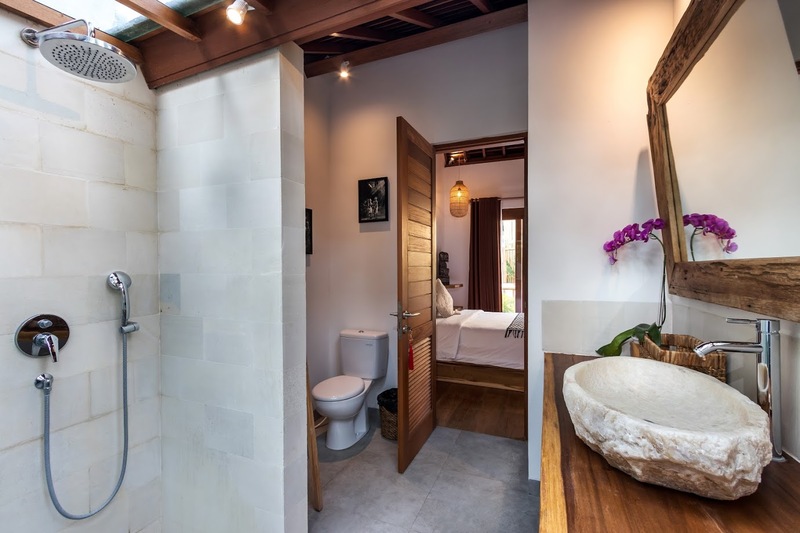 An en-suite bathroom with a shower area is found accompanying the bedroom. 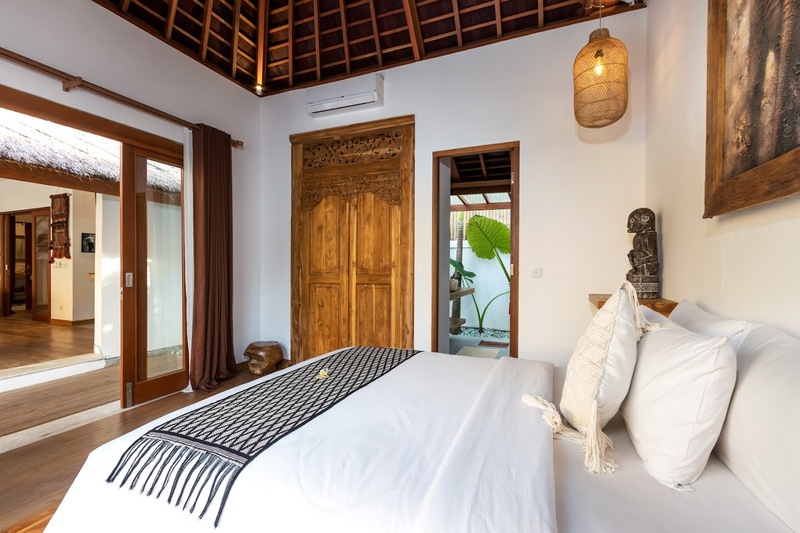 The second bedroom is on the main floor, leading to the pool area and adjoined to the living room. 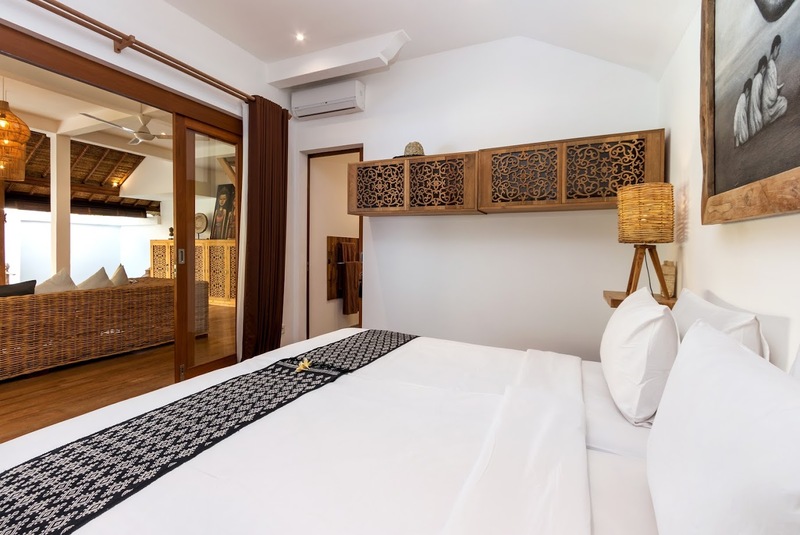 While you enjoy a good night’s rest on the comfortable queen bed, be sure to relish the garden view as well. 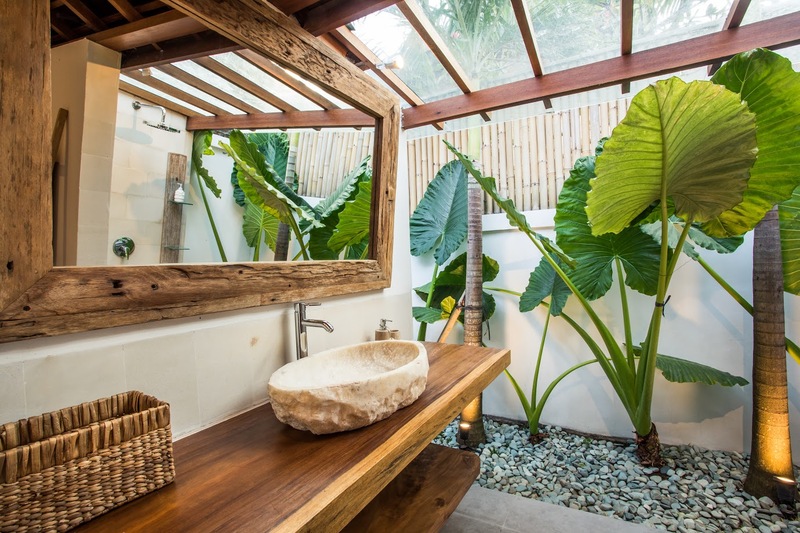 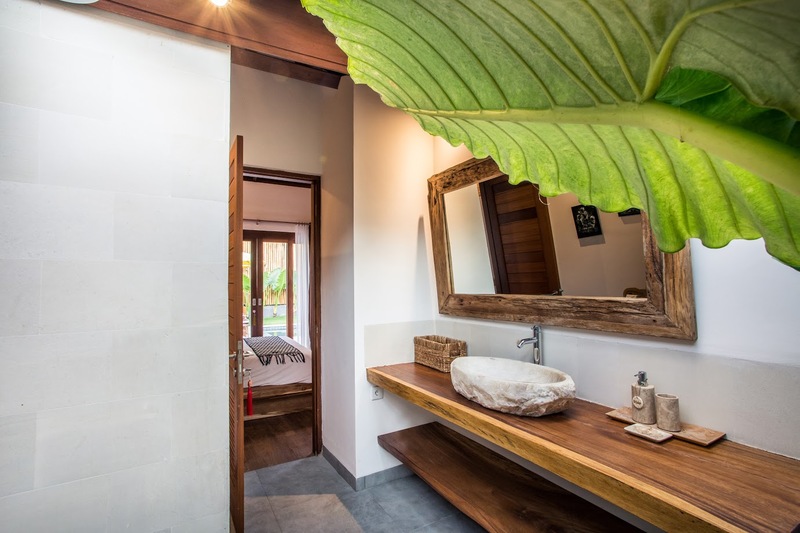 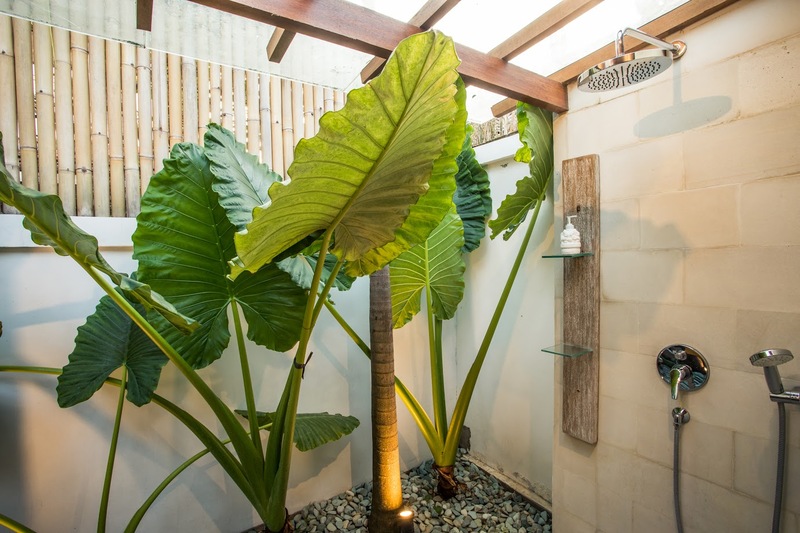 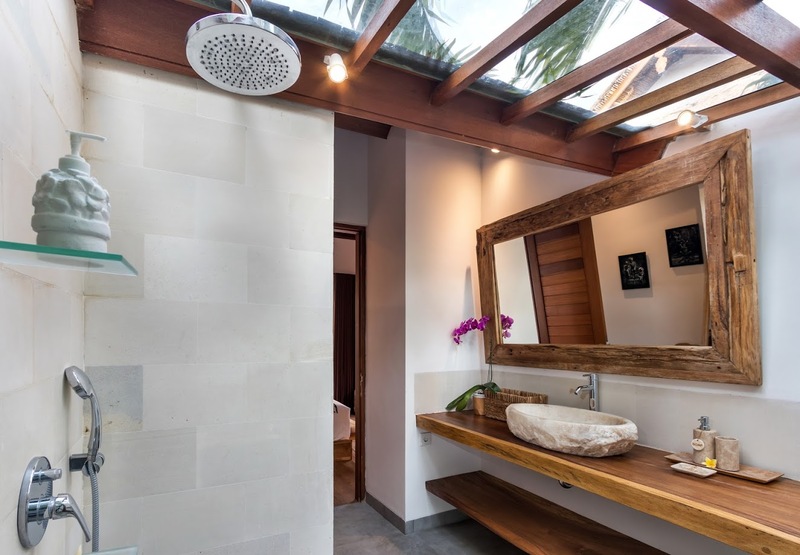 The en-suite is partially open-air with plants around a tropical shower. 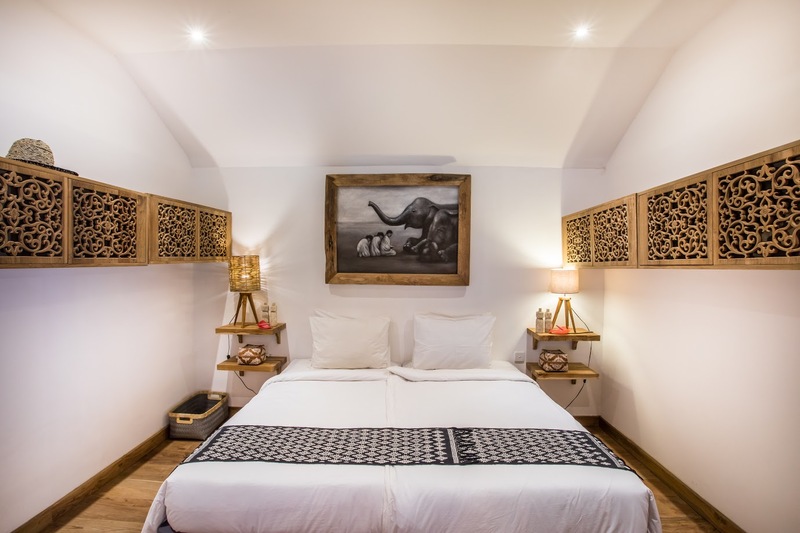 The third bedroom is tucked away in the living area with twin-beds and an en-suite bathroom. 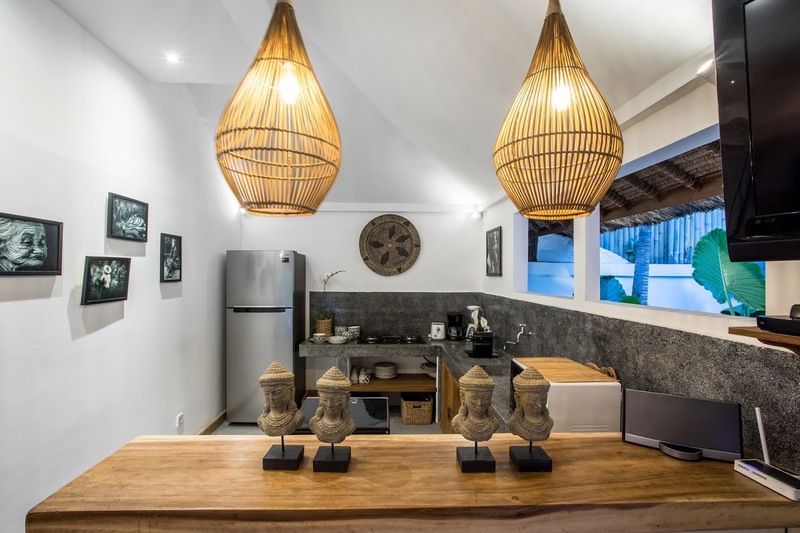 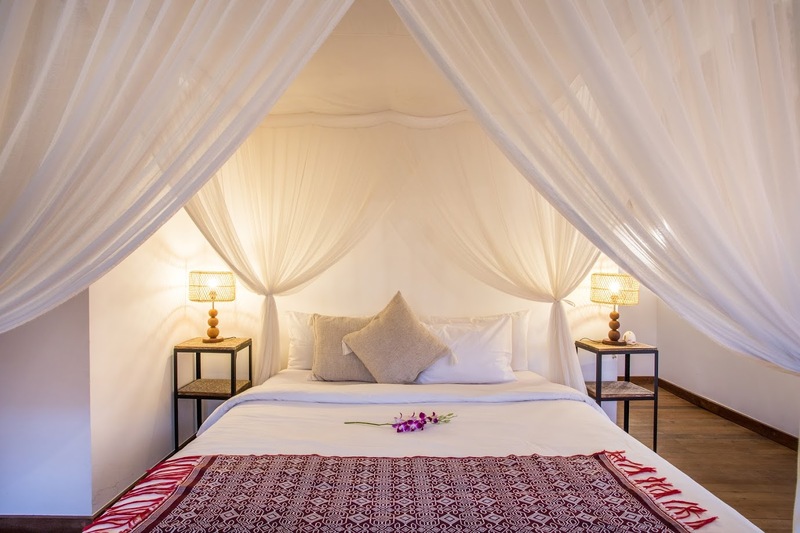 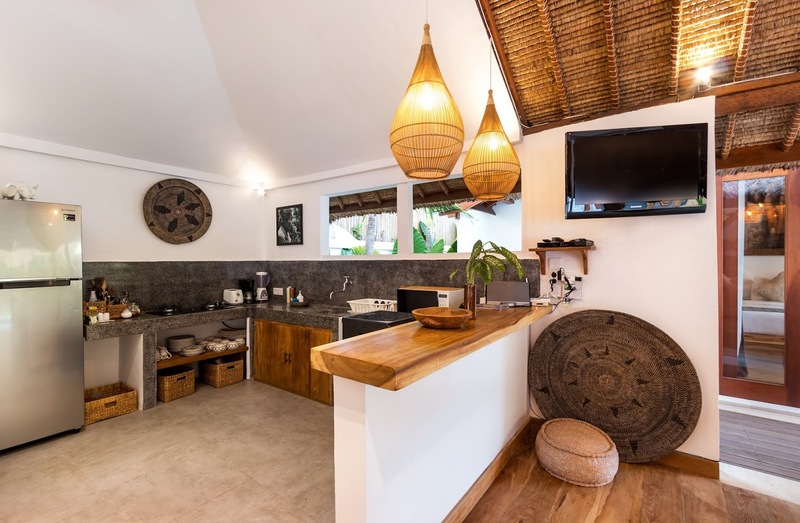 The friendly staff at Villa Waterlily will happily look after your needs while you stay and ensure you have everything to make you comfortable. 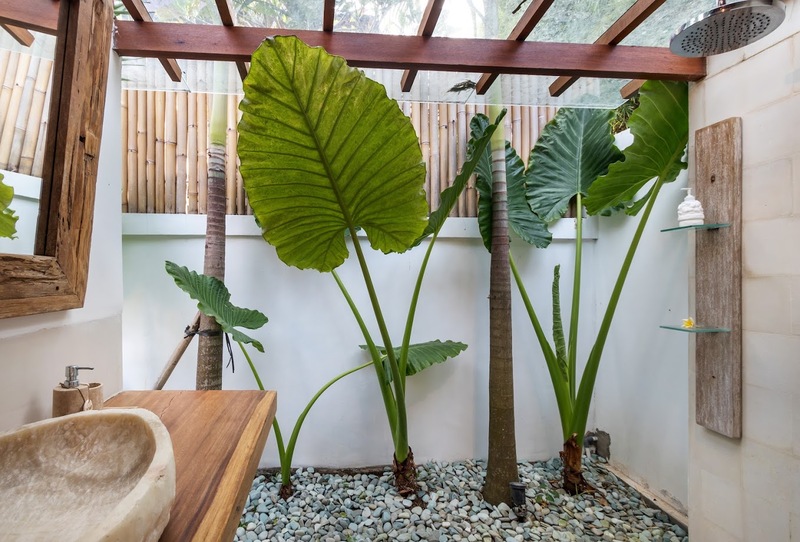 After settling in, indulge in a massage in-house that can be arranged upon request. 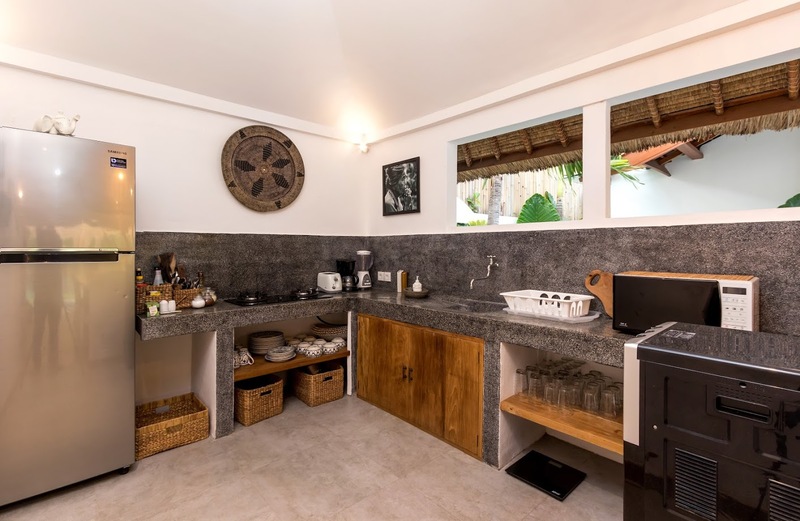 There are car rentals available at an added cost, and if you wish decadent meals can be prepared just for you! 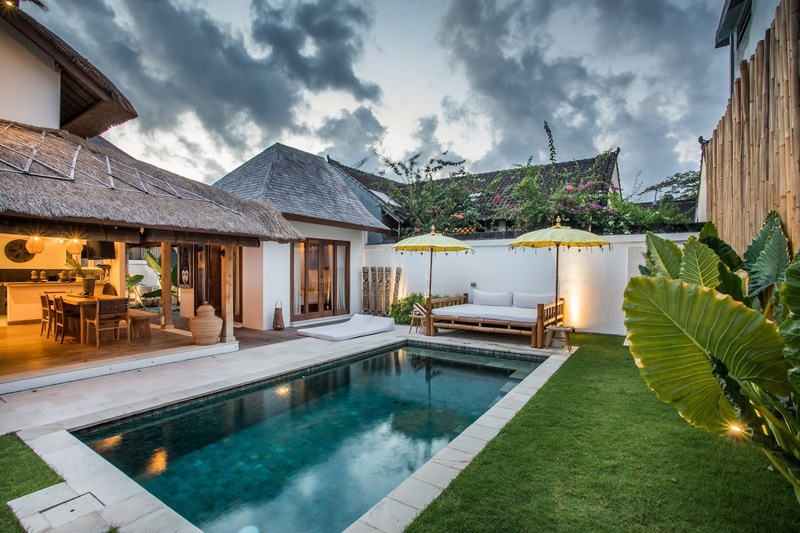 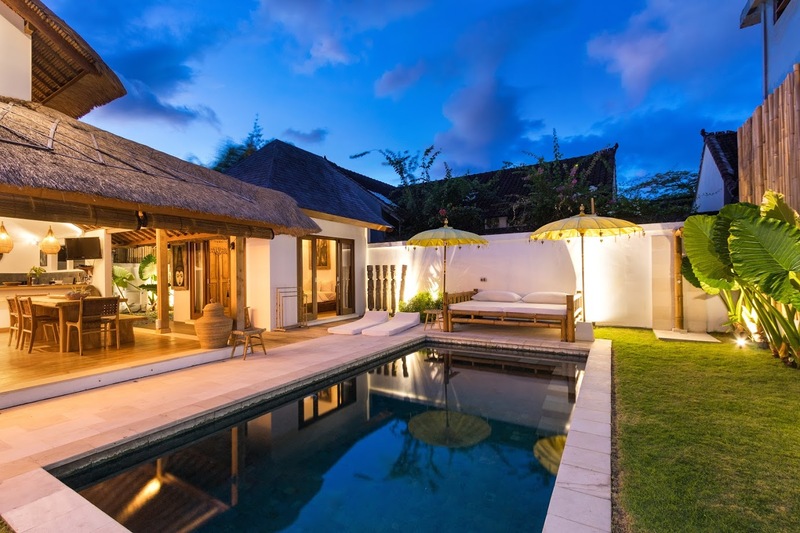 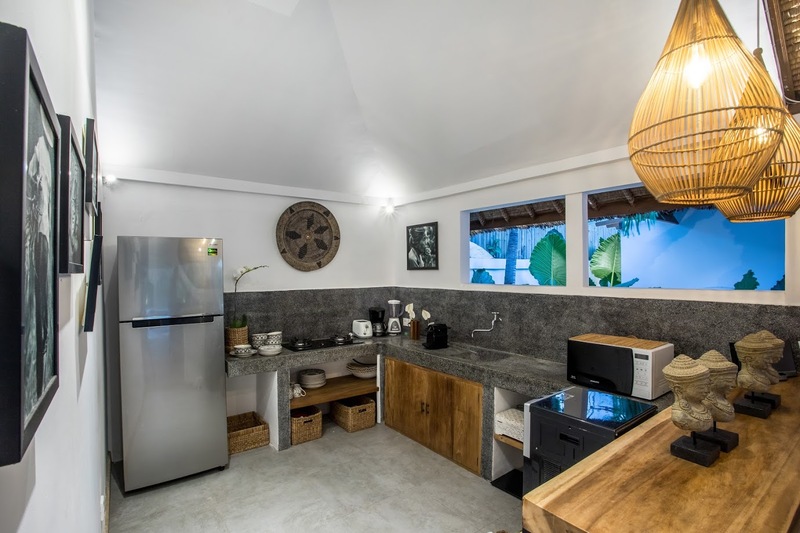 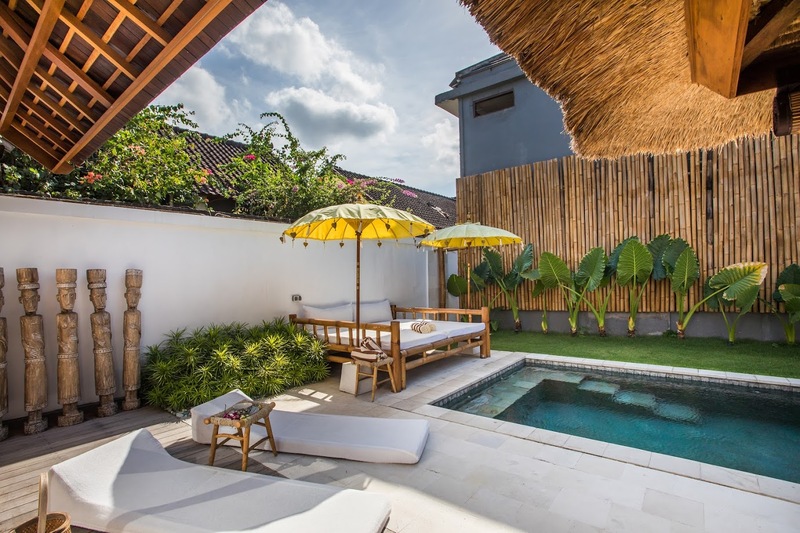 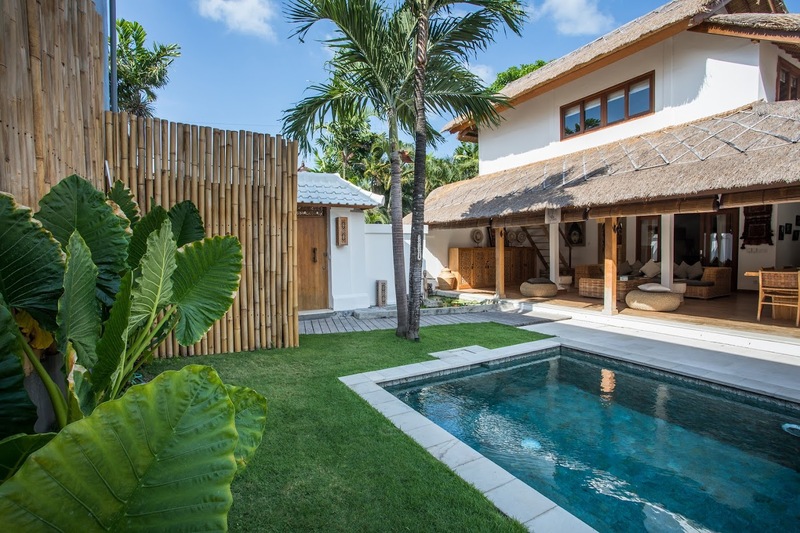 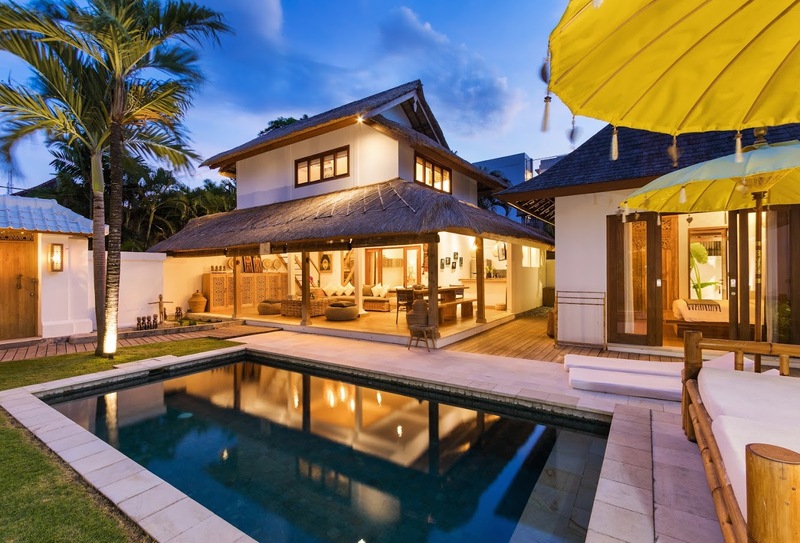 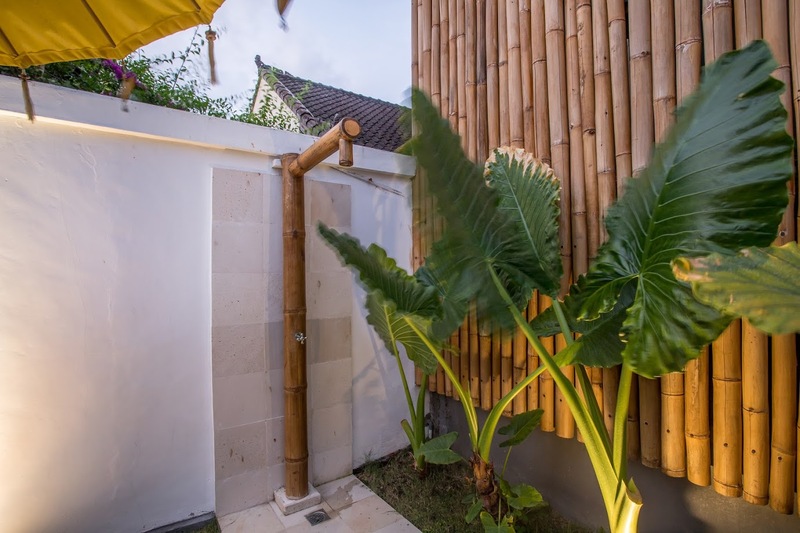 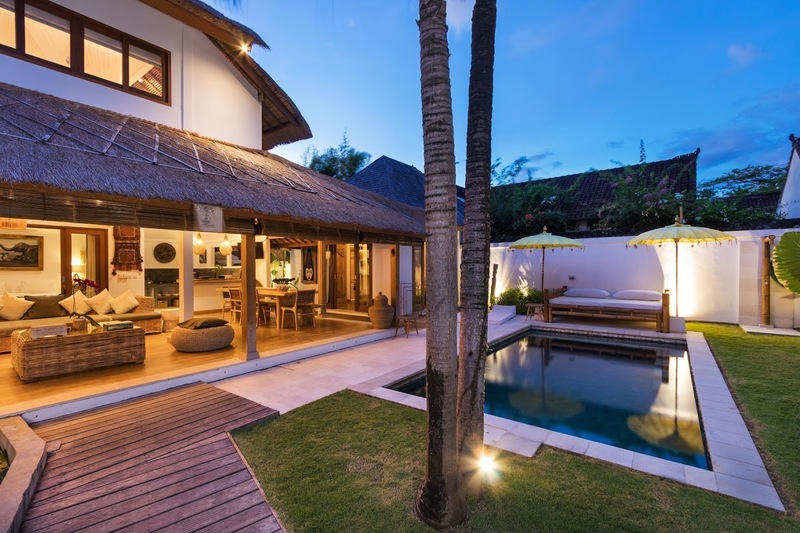 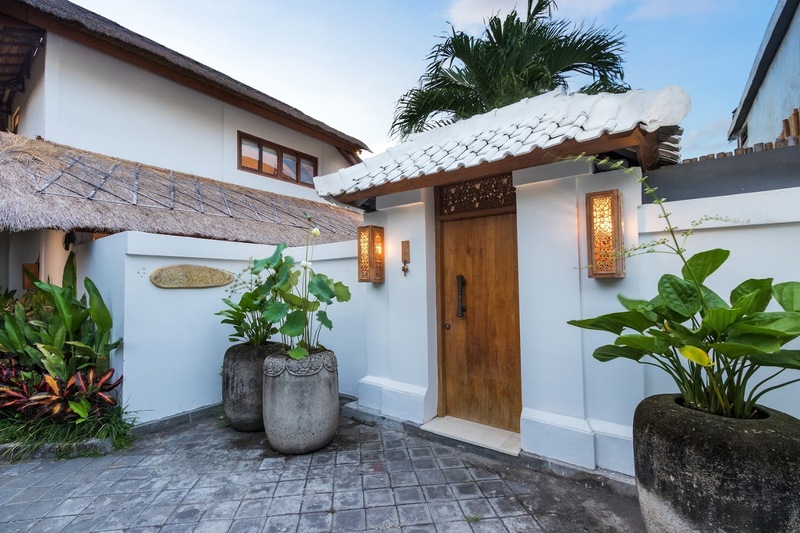 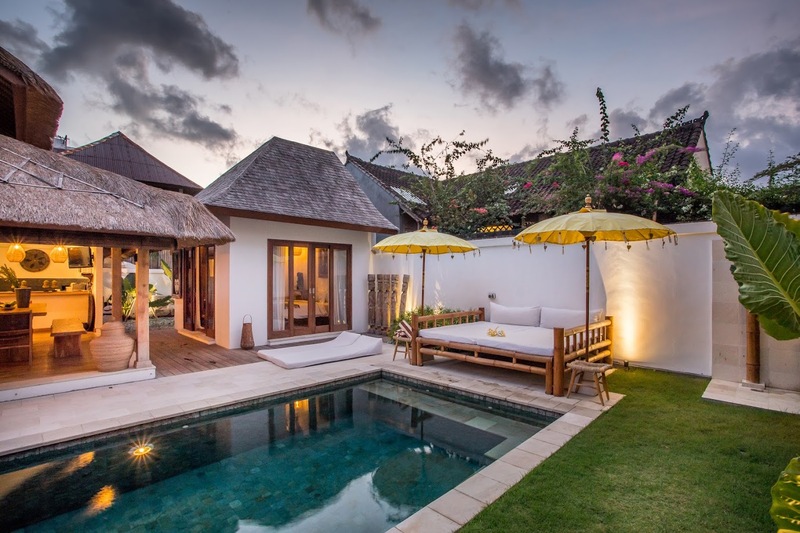 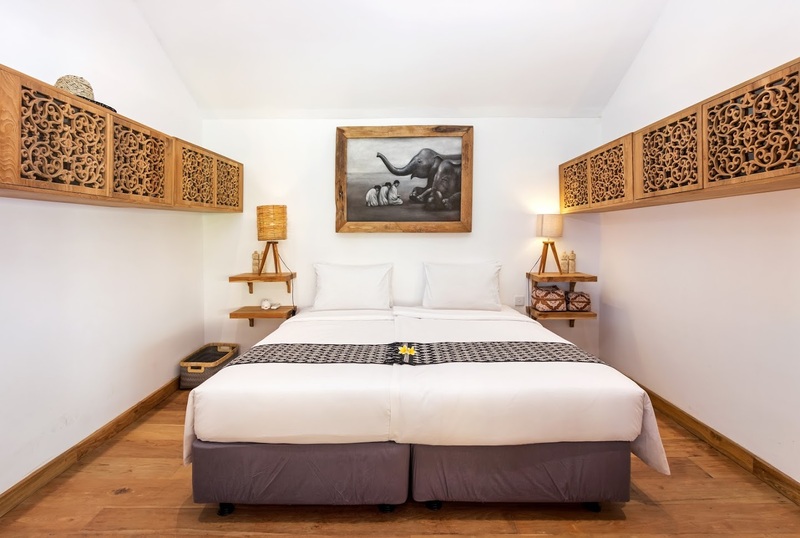 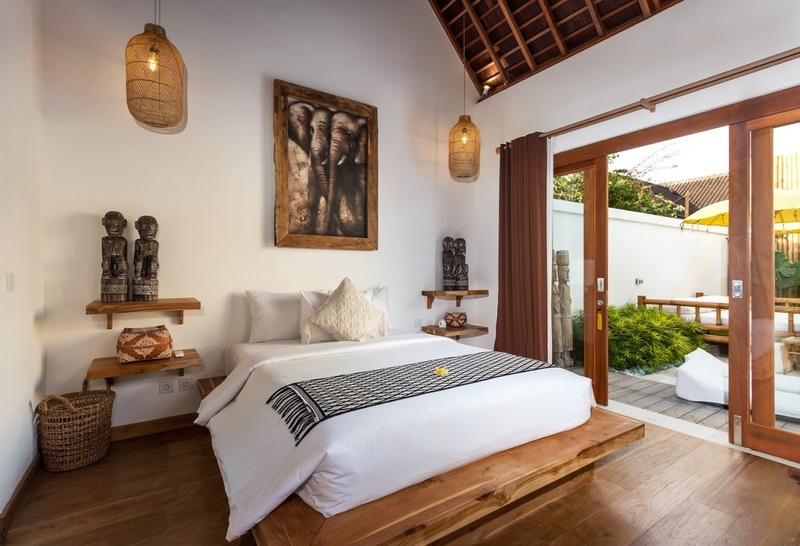 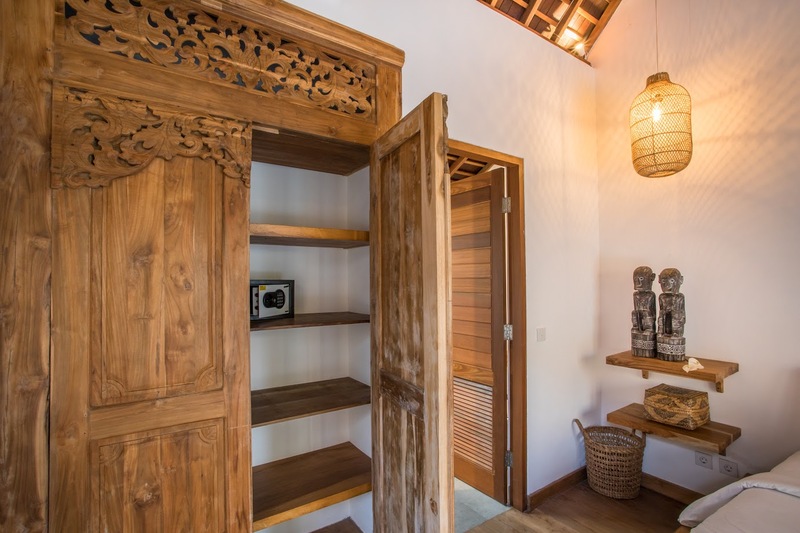 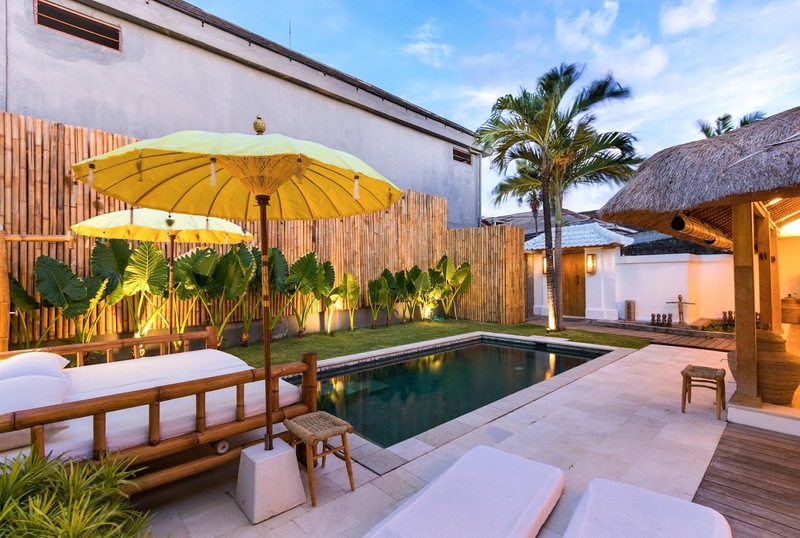 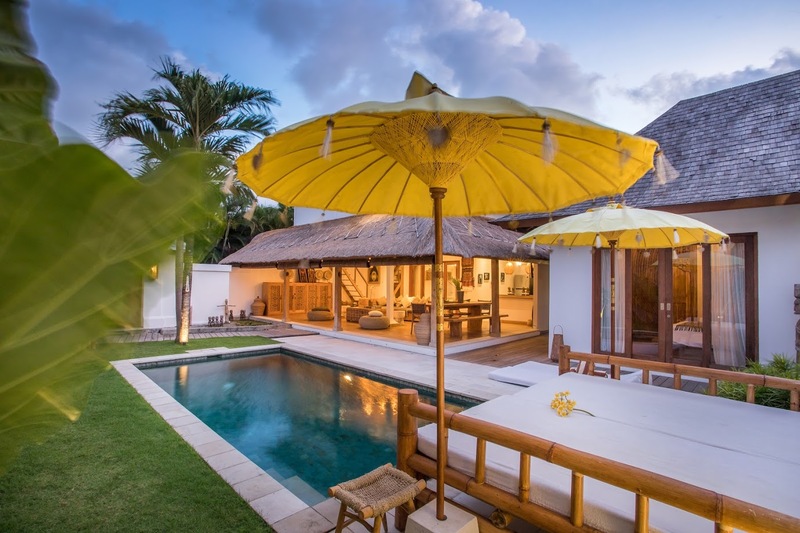 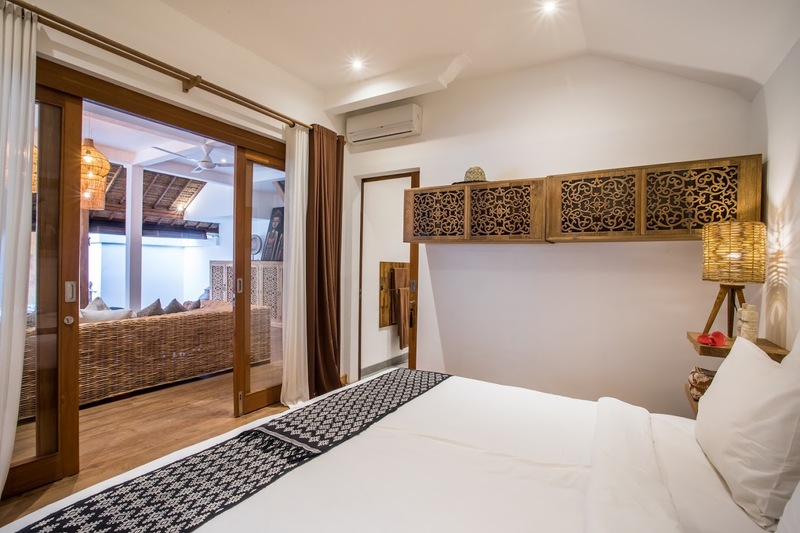 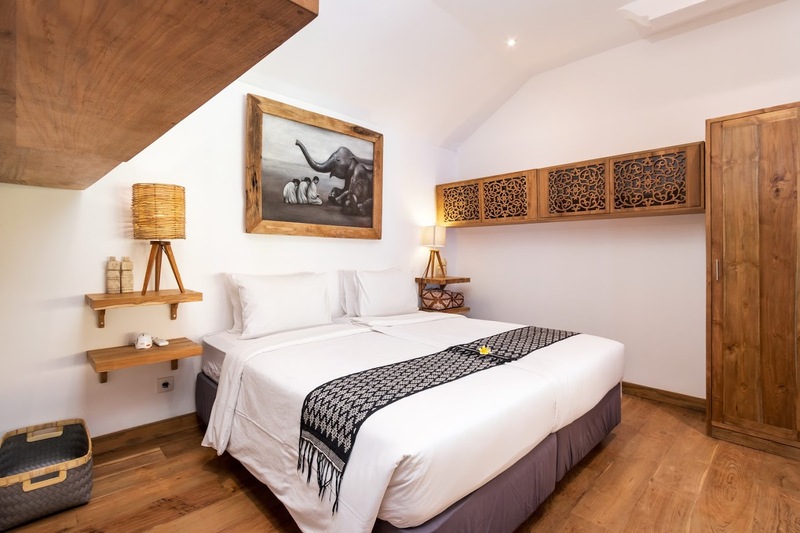 Steps away from Double Six beach, where you’ll find an array of beach bars and restaurants, the villa is ideally situated in Seminyak’s streets. 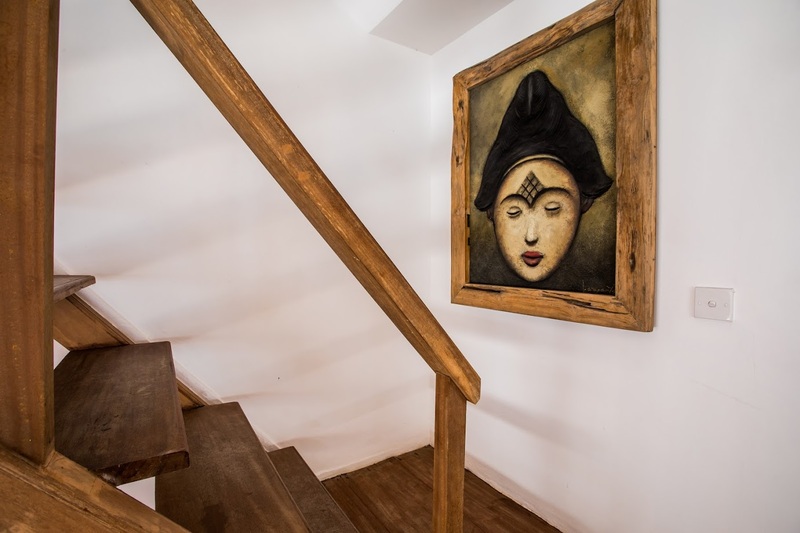 Close to Oberoi’s eat-street, you have unobstructed access to eateries, hip cafes, and shops. 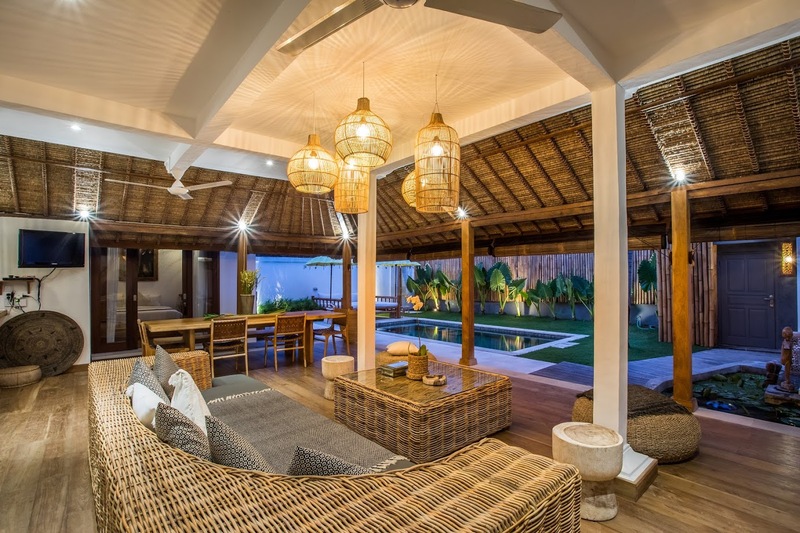 You can visit one of the beach clubs like Ku De Ta and Potato Head for a fun night out.